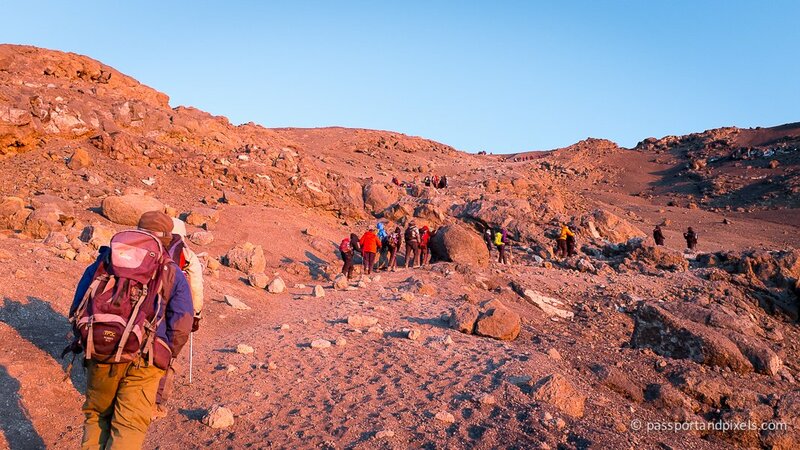 This is the seventh part of my day-by-day account of what it was like to climb Mount Kilimanjaro. If you missed it, Day Six is here. Today: the day we’d all been waiting for. 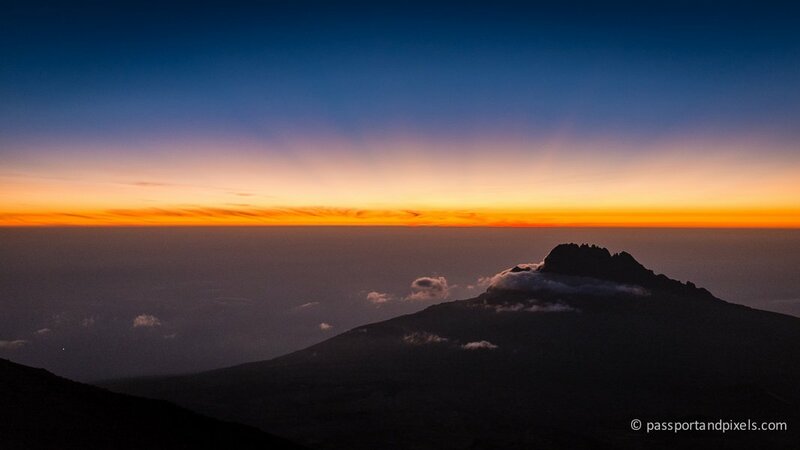 Kilimanjaro Summit Night! 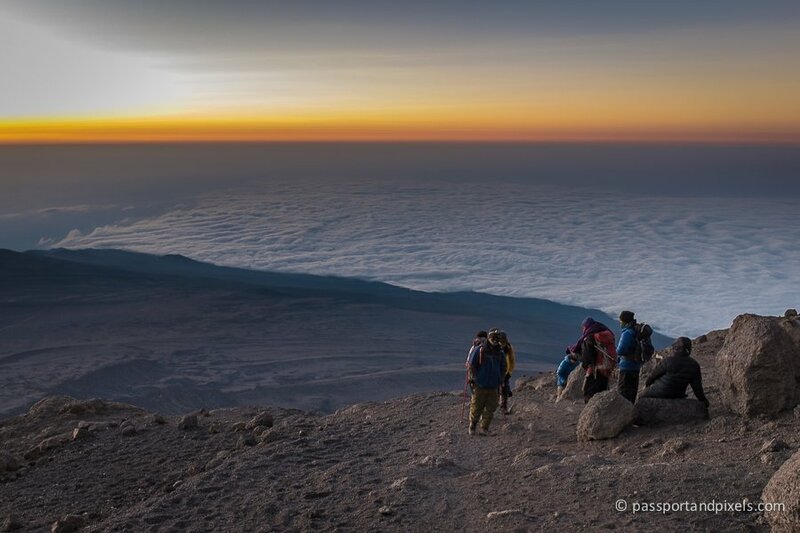 If you think it’s hard having to wake up at 4 am to catch a flight to go on holiday, imagine what it’s like being woken at 11 pm after about three hours of light dozing to climb a mountain. The only good thing I can say about it is that I’m delighted it’s something I will never have to do again! 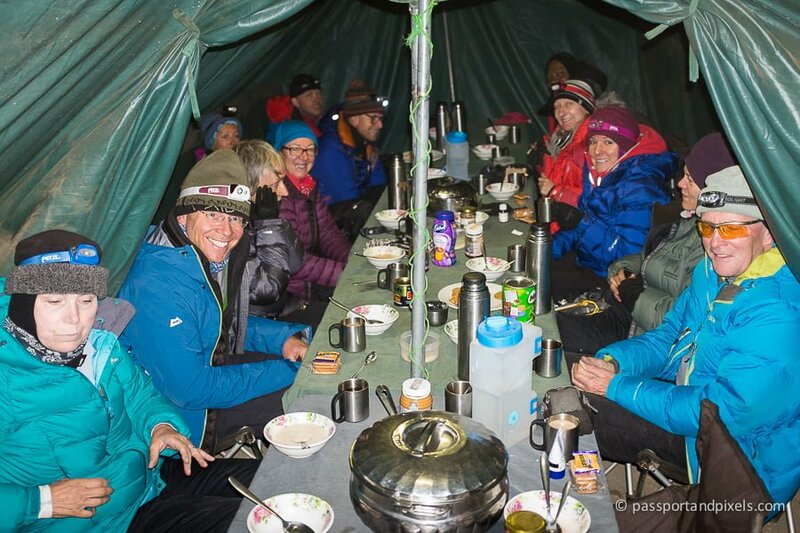 Other things I did not enjoy about getting ready to depart on summit night: being force-fed breakfast of bread and porridge (carb-loading, anyone?) at 11.30 pm; and the faffing. Oh God, the FAFFING!! 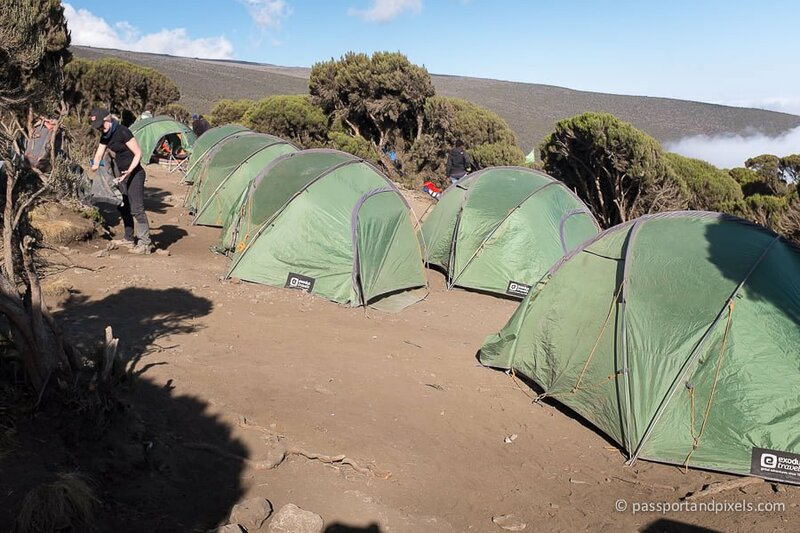 In general, our group had been pretty good about being ready to go on time, but a combination of sleep deprivation, darkness, and (probably) unwillingness to leave the relative comfort of the camp meant that at least half the group were hopelessly disorganised. We were supposed to be ready to hit the trail at midnight, and a few of us were. But then we stood. And waited. And waited. 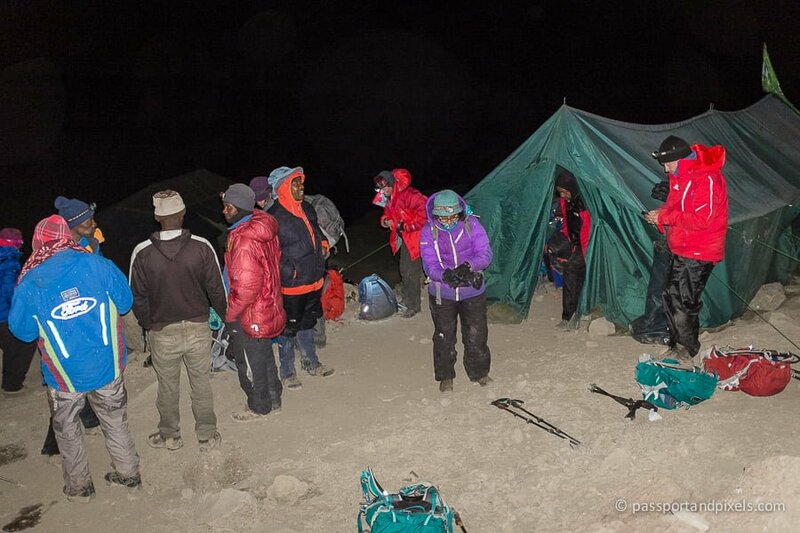 While the rest ambled around, slowly finished breakfast, or looked for their missing gloves and head torches. Added and removed layers. Untied and retied boots. Had one last trip to the toilet tent. And on it went. For half an hour! The going was fairly solid underfoot. 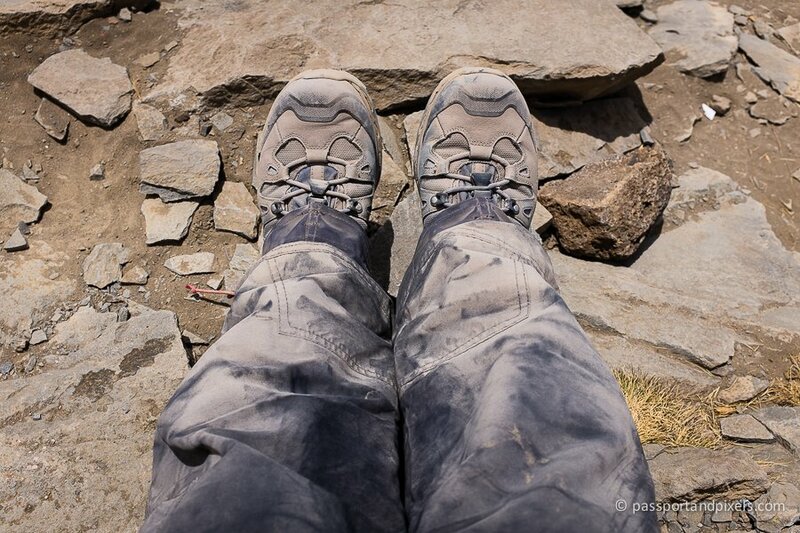 I’d expected it to be loose scree and therefore quite slippery, but it was pretty firm and my boots held up well. In fact apart from the boredom the only real problem I had to begin with was being too hot! It was a relatively mild night, with no wind chill, and my rented down jacket was extremely warm. So with all those extra layers underneath I soon started cooking, and had to make use of the first couple of rest stops to shed them. 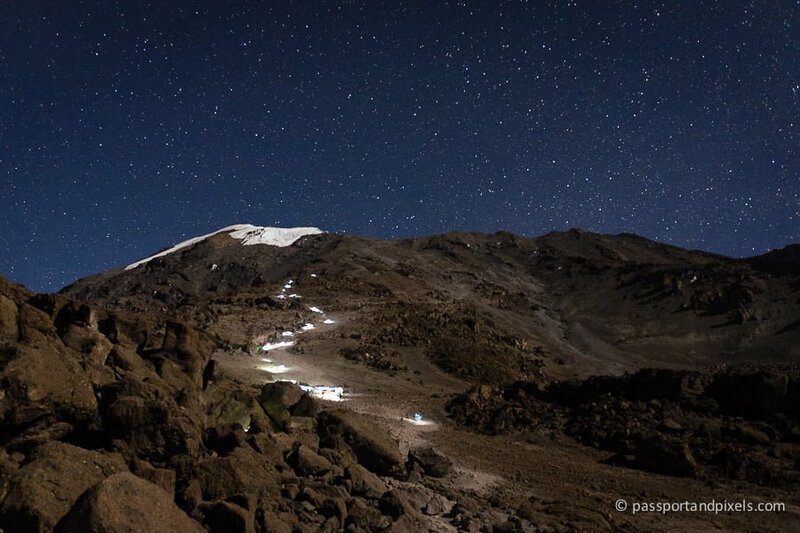 I also took advantage of one break to prop my camera on a convenient rock and take this photo of the path to the summit with the stunning clear night sky above. So it was all going remarkably well, and then, a few hours in, at around 5500 m, something happened. 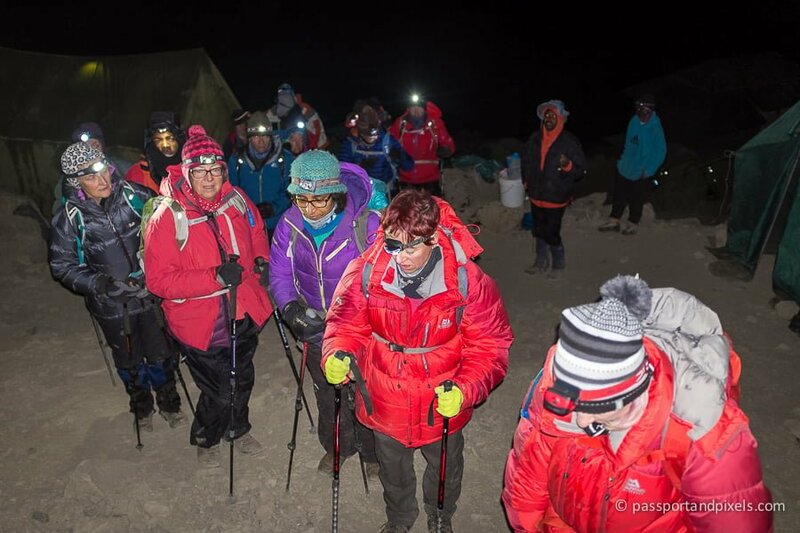 We’d stopped for yet another rest, and just as everyone was getting ready to go again I was suddenly overcome with a wave of nausea so strong that I couldn’t stand up. I felt faint, cold and dizzy, and really, really sick (although I didn’t actually throw up). I had to sit with my head between my knees and try to breathe, all the while gripped with fear that this was the beginning of the end. They say altitude can get anyone, regardless of age or fitness, so what if it was about to get me after all? What if all my charging around with the camera, and my confidence, had been ill-advised? What if after all those days of being at the front of the group, getting frustrated with the slow pace, it was finally going to be ME that crumbled and failed? But the nausea eventually subsided and after putting layers back on I was able to carry on. As I got going, I felt better… until we stopped again, when the same thing happened. More weakness, more nausea, more sitting, head down, trying to breathe. And this time it wasn’t just me. As people were getting stuck into their snacks and water another member of the group suddenly collapsed. 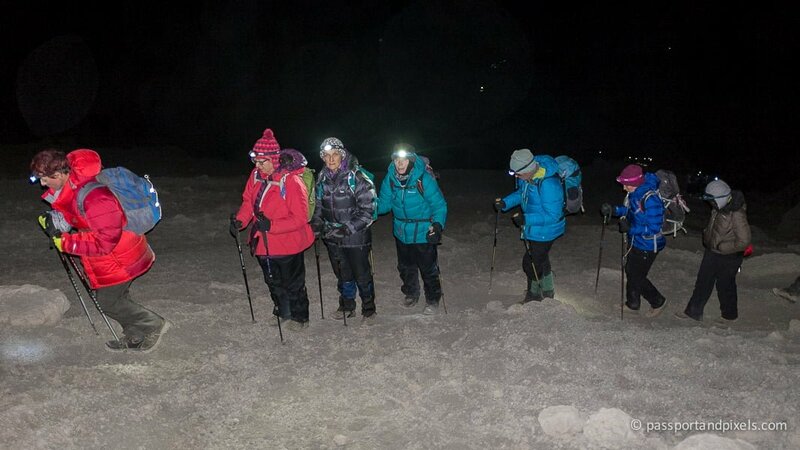 There was a momentary panic as guides swarmed round her, calling for hand warmers and spare layers to help warm her up. 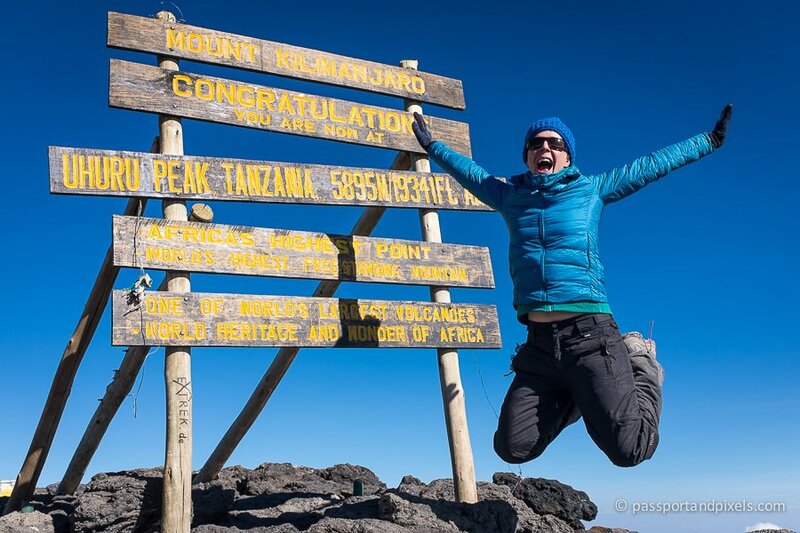 Having heard so many horror stories about what altitude sickness can do to you it was a pretty fraught moment, but she soon recovered and was able to carry on. But what had become very clear, for me at least, was that stopping meant getting cold, and getting cold was Not Good. So my friend and I decided to stop stopping. We didn’t need to rest: we could both quite happily maintain that slow and steady plod pretty much indefinitely. 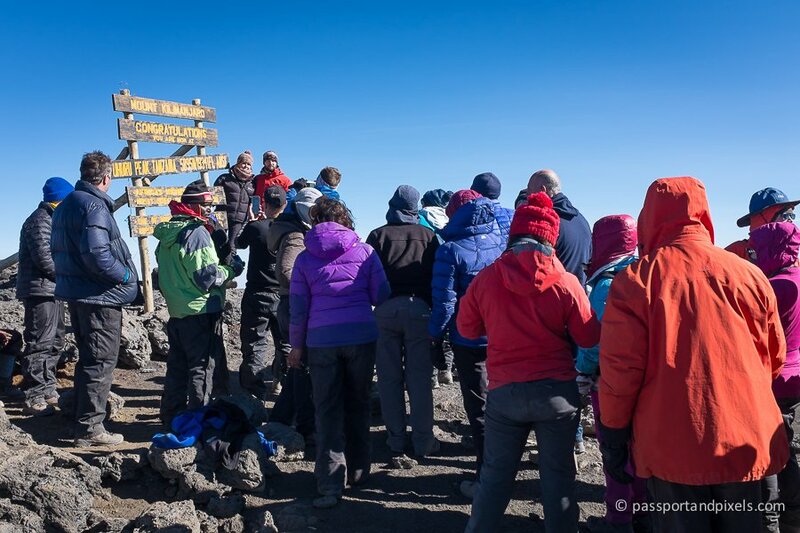 And fortunately the African Walking Company had provided one guide for every two people, to allow for people to walk at different paces, or to look after those that couldn’t make it. So we are able to head off ahead with our lovely guide Stratton, and leave the rest of the group behind to go at their own pace. And soon, after a few more hours of plodding uphill, the sun started to come up, and it was just about the Best Thing Ever. When that orange glow began warming up the sky, it lifted my spirits like nothing else. Finally, I knew the end was in sight. I had no idea how long we’d been walking for, but if the sun was coming up that had to mean we’d broken the back of the night. From here it was only going to get lighter, and warmer. Finally we could look around and see where we were going, and enjoy the view rather than just staring into darkness. That’s not to say the rest of the climb was easy. In fact I’d say the last 250m of vertical ascent was quite a struggle. My legs, feet and back were quite sore after hours of non-stop walking, and I was extremely weary to say the least! But warmed by the sun, and with the end within our grasp, we were spurred on with renewed determination. Making it to Stella Point was probably the best moment of the entire trip. 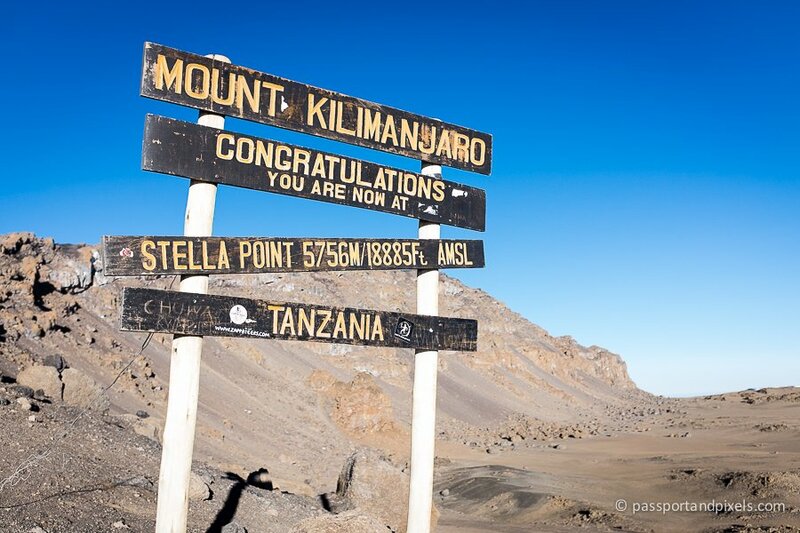 Although it’s not quite the top, from Stella Point it’s only another hour or so of very gentle uphill to reach Uhuru Peak, the summit. Get to Stella Point in one piece, and you know you’re definitely going to make it. The relief and elation are pretty intense! 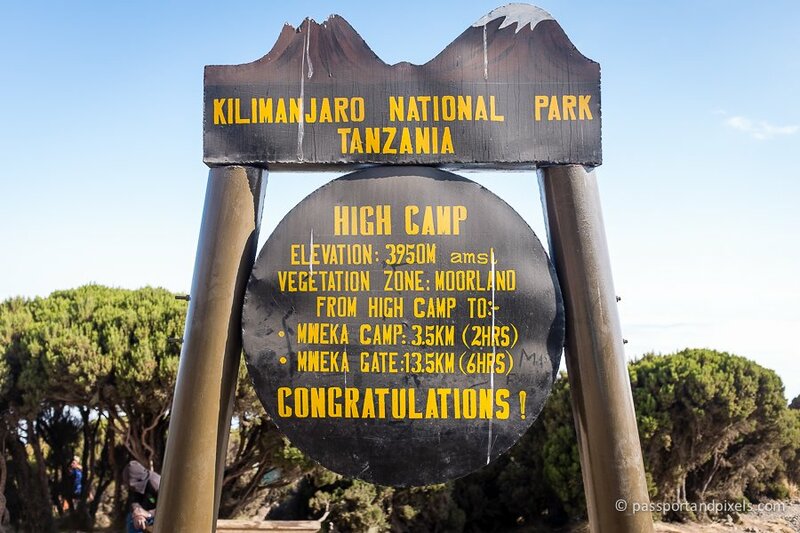 So after a brief pause at Stella Point to take a photo and enjoy the warm feeling of achievement we pushed on – the final assault on the summit! 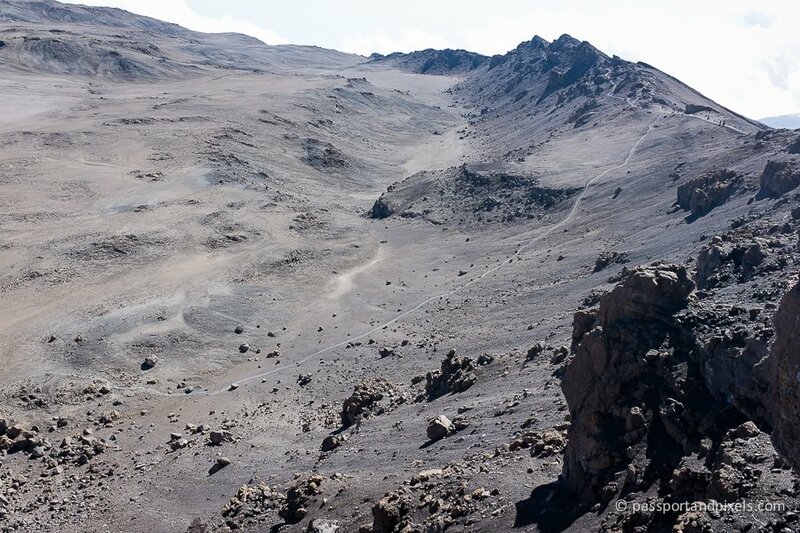 The path from Stella Point to Uhuru Peak takes you along the crater rim. 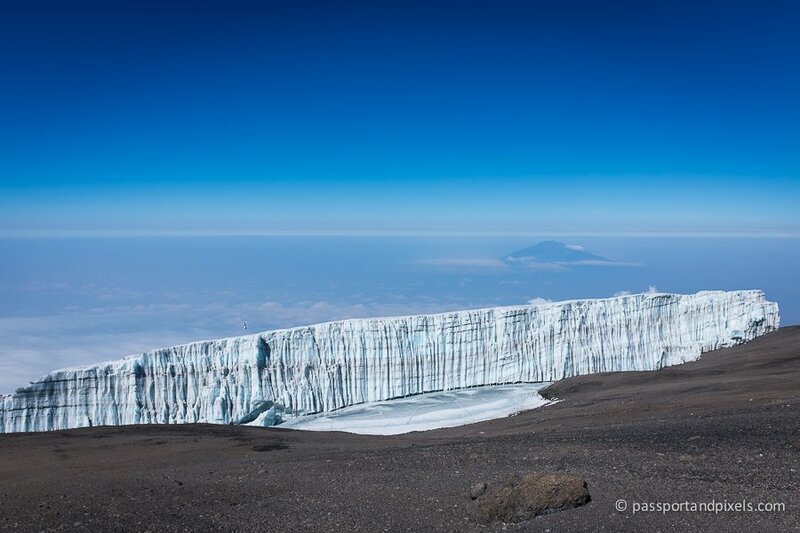 On one side you can look down into what used to be Kibo crater while on the other you can clearly see what remains of Kilimanjaro’s glaciers (now sadly just a fraction of their former selves). And far off in the distance, the ever-present Mount Meru. Little by little, slowly slowly, we gained ground. 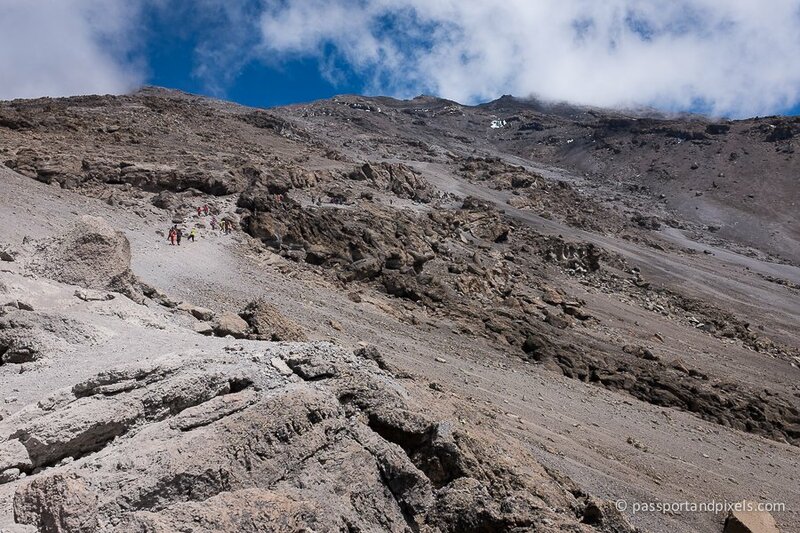 As we progressed, we passed others on their way back: climbers who had made it to Uhuru and were starting their descent. They offered words of encouragement and reassured us that we didn’t have far to go. Still, it was tough, and at one point my friend started retching and we had to stop so she could recover. It was really a case of get in, take your photo, get out of the way for the next person. Which was a shame as it rather put a dampener on the experience of having made it to the top. 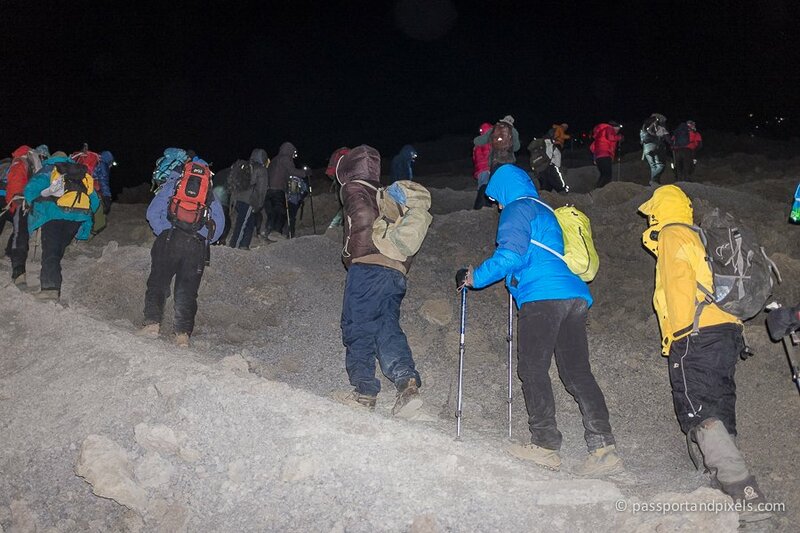 But I guess if you will choose to do the climb in the dry season when the weather is at its best, you have to be prepared to deal with the crowds. And the weather certainly did us proud. Look at that blue sky! We waited at the top for a while, and gradually other members of our group arrived. All bar one person made it, which was impressively good going, especially since some of them had been seriously struggling. They must have had to dig down into every last reserve of determination and strength to keep pushing all the way to the top! But we couldn’t stay long – we still had an awful lot more walking to do – so we began our descent. 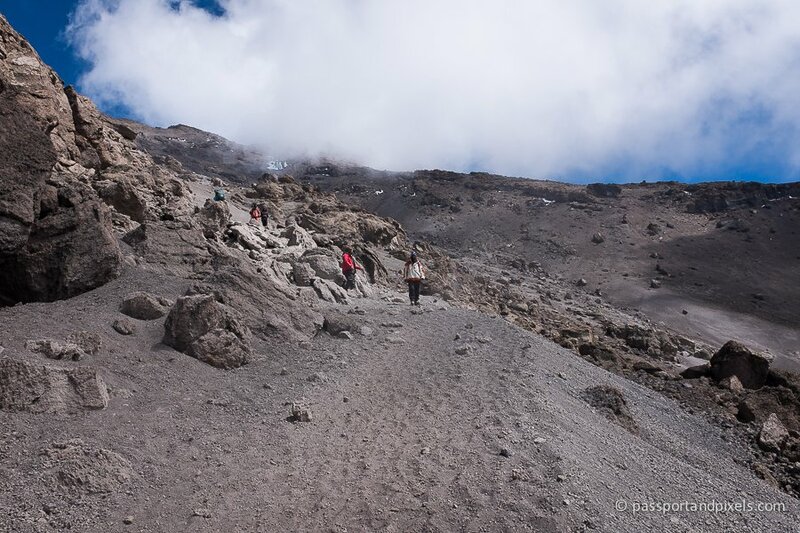 Much of the path was deep, loose scree, so we were able to progress fairly quickly, bouncing down and digging our heels in so that the soft surface cushioned each step. Having carried my walking poles and barely used them for a week, this was where they finally came in handy, helping me to balance and avoid falling over. And after another three hours or so, shaky-legged, achy-footed, sore-backed, and VERY dusty, we made it back to Base Camp. Blue boots and black trousers, believe it or not! The rest of the day is pretty much a blur. 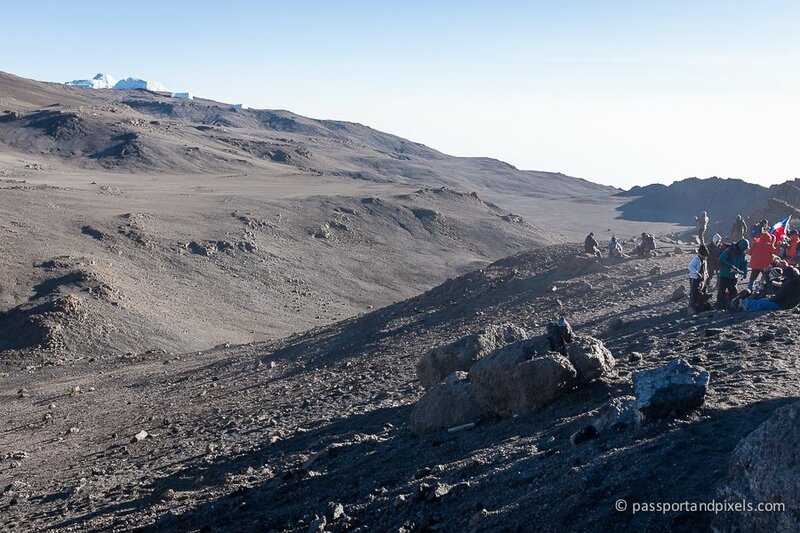 We had a couple of hours downtime at Base Camp while we waited for the remainder of the group to return, and then after lunch it was another 3 hours walking to get down to our camp for the night. In all, we’d done about 14 hours of walking and were very much in need of a wash and a lie down. I’m not a huge fan of camping, but I don’t think I’ve ever been so happy to see a tent! 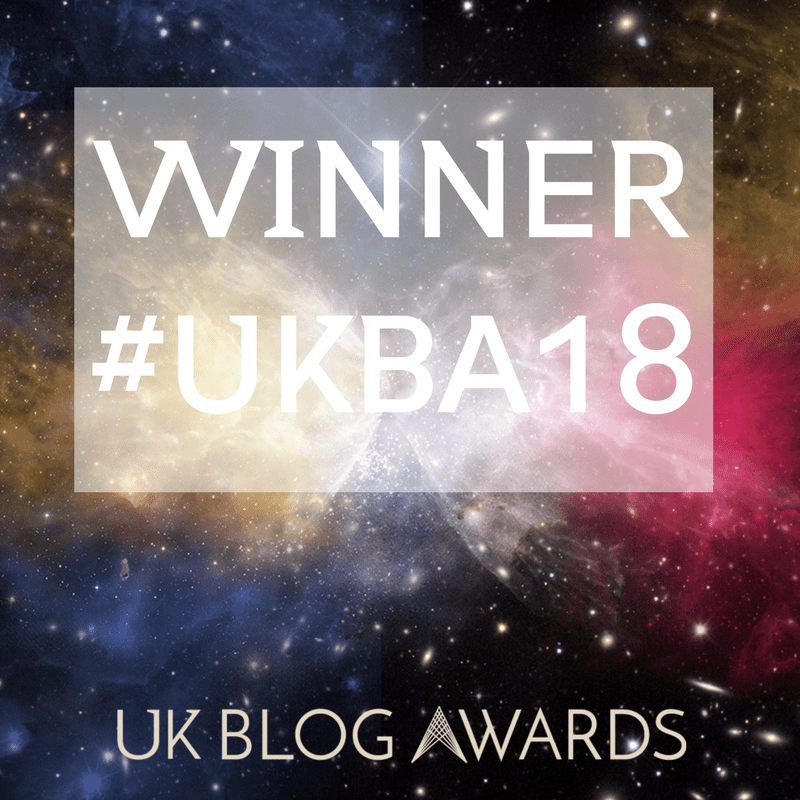 To find out how we got on on the final day, click here.